There are many airports that serve the whole Oklahoma state. Oklahoma City, the capital of Oklahoma state has the airport named Will Rogers World Airport. 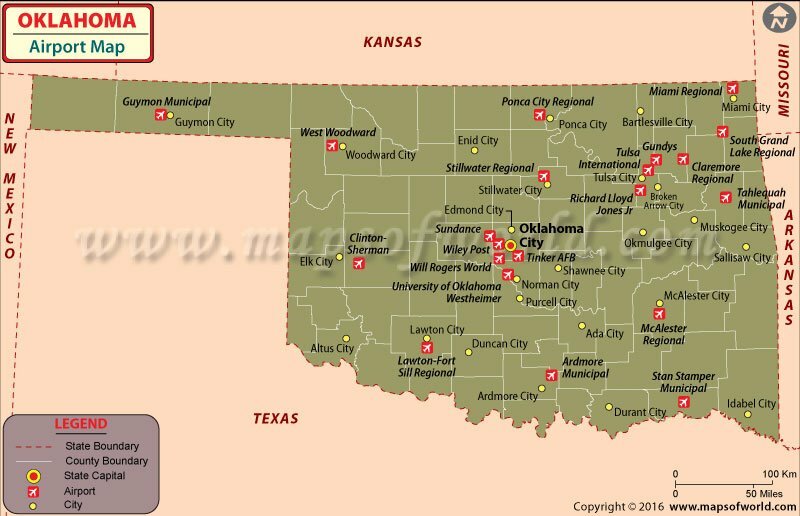 There are 149 airports in Oklahoma. Of all the airports in Oklahoma, only the Tulsa International Airport is international airport in Oklahoma, and flies more than 3 million passengers a year. Other major airports in Oklahoma are the Enid Woodring Regional Airport, the Lawton-Fort Sill Regional Airport and Ponca City Regional Airport. The amenities and services offered by these airports include ATMs, news and gifts shops, various restaurants, retail stores, a chapel, a conference room, massage chairs, shoeshine shops and a hair salon. The airlines that serve this airport are American Airlines, United Airlines, Frontier Airlines, Delta Airlines, Northwest Airlines, Comair, Southwest Airlines, Champion Airlines, Skywest Airlines and ASA. The Will Rogers World airport in Oklahoma City is the busiest of all the airports in Oklahoma in terms of commercial passengers who use the airport annually. Some of the services and amenities provided by this Oklahoma airports include WiFi, shoeshine shops, ATMs, coffee shops, bars, restaurants and retail stores. The airlines that serve this airport are American/ American Eagle, Frontier, Continental, Northwest, Delta, Champion Air, Southwest, United Airlines and US Airways.